Spotted Salamanders live in upland forests and reproduce in temporary pools and wetlands. Habitat in both upland forests and lowland breeding pools have been lost because of urbanization. Roads and other barriers further fragment remaining habitat, making it difficult for salamanders to move between their upland habitat and their breeding pools. 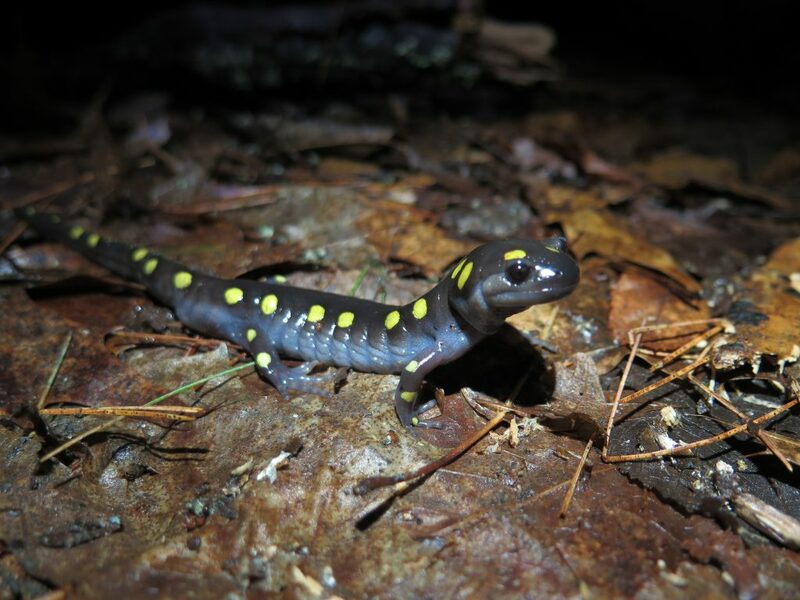 Spotted Salamanders are helped seasonally by grassroots, citizen science efforts to move salamanders across roads during their spring migration (often called the Big Night). These are prominent events in the Northeastern U.S., where migrations are shockingly synchronous with the right conditions. Some nature centers (such as the Harris Center for Conservation Education and Hitchcock Center for the Environment) organize “Big Night” events, but these are often undertaken by unaffiliated citizens. On anticipated Big Nights, people are deployed to stations where known salamander migrations occur and take part in bucket brigades, which essentially watch for and move salamanders across the road out of the way of cars. There are also a number of examples of successful tunnels under roadways that are used by Spotted Salamanders and other amphibians and small terrestrial animals. Designing new roads and retrofitting old roads with tunnels could greatly reduce road mortality and mitigate forest fragmentation. Finally, it’s important to protect critical habitat like vernal pools and other fish-less ponds. Spotted Salamanders can tolerate a wide range in temperature regimes and are generally well adapted to extreme and variable weather events. However, changes in the hydrology of seasonal pools may reduce breeding habitat. Pollution is mostly a threat to populations with breeding pools near roads and other human development. Pollution can reduce hatching successes and juvenile survival. More urban breeding pools are choked with an invasive reed, which reduces habitat quality. Non-native earthworms can also negatively impact the soil habitat quality for Spotted Salamanders. Garden with native species and check your local area for opportunities to volunteer to remove invasive species. Don’t release bait species. Spotted Salamander larvae are susceptible to Ranavirus, but it hasn’t significantly impacted the population yet. Spotted Salamanders have been tested to carry a strain of Chytrid, Batrachochytrium dendrobatidis, but they appear to be relatively resistant to the fungus. Don’t move between wetlands without treating shoes, pants, and waders with chemicals meant to kill amphibian diseases, but not impact aquatic habitat. Adult Spotted Salamanders spend most of their time in forest floors. In the spring time, when the conditions are appropriate, breeding adults make a migration from forests to a breeding pond, where they spend time breeding and laying eggs. Eggs are deposited in gelatinous masses, typically with 20 – 200 eggs per mass. Following breeding, they exit the pond to return to upland forest habitat. Larvae are carnivorous and grow rapidly. They leave the wetland pools where they were born after metamorphosis and seek out suitable habitat in upland forests. It takes years for a juvenile to become a breeding adult. Adults do not breed each year.